Mason Jars gifts, whether store-bought or DIY, make adorable and useful gifts for anyone, whether male or female. From candy to candles, speakers to soap, Mason Jars are a quirky way to give gifts for any occasion, and as the jars are reusable the memories will linger long after the gift has been used. The Jar-Z Mason Jar Jacket is a 32” insulated slip-on cover for your jars. It keeps down condensation to give you a better grip on your jars, while offering protection for your jar. Your contents will be kept out of sight and out of the light. These make great stocking stuffers or gifts for the home-canner. When space is limited, you can still grow beautiful flowers with Mason Jar Indoor Flower Garden. With a little water and a sunny area, this Mason jar kit includes everything you need to grow beautiful pansies, zinnias, or English daisies in your apartment, dormitory, or office. Stackable Mason Jar Measuring Cups will make a perfect gift for the mason jar collector. These ceramic, stackable cups come in 1 cup, ½ cup, ⅓ cup, and ¼ cup measurements. They look great on the counter or on the pantry shelf until ready to use. Ball Heritage Collection Quart Jars are a limited edition regular mouth pint and wide mouth quart-sized jar. They are purple in color and withstand the quality you expect from Ball. Whether you are canning or making gifts in a jar, you’ll love this collection. Saving food is made easy with the FoodSaver Wide-Mouth Jar Sealer Kit. Used with the FoodSaver vacuum sealing systems, it makes the sealing process of wide mouth and regular mouth lids easy for making gifts in a jar or to store for future meals. You’ll wonder why you waited so long to buy it! Turn your Mason jars into a vase, toothbrush holder, and more with Loew Cornell Frog Lid Inserts. In place of a regular mouth metal lid, add one of these inserts in its place with a metal ring, and transform any gift in a jar into something memorable. It’s five o’clock somewhere with this Honey Sweetened Cocktail Set. This honey-based syrup is a healthier alternative to the regular sugary syrups used in cocktails. This set includes an all-natural 5-ingredient syrup, a Mason jar with a special copper shaker lid, and a flour sack towel. Makes a great party gift for home entertainers. This one-of-a-kind Public Radio Single Station Tuner is a made-to-order radio in a Mason jar.. Attach the antennae, add batteries, and it’s ready for 30 hours of listening pleasure. It’s preprogrammed to a local station of your choice. Makes a perfect gift for a jar collector. Turn Grandma’s canning jars into a to-go cup with the Jarware Drink Lid. These BPA-free plastic lids fit jars with the metal ring for one-of-a-kind glass drinkware. It is made from BPA-free plastic and is dishwasher safe to make cleaning a breeze. 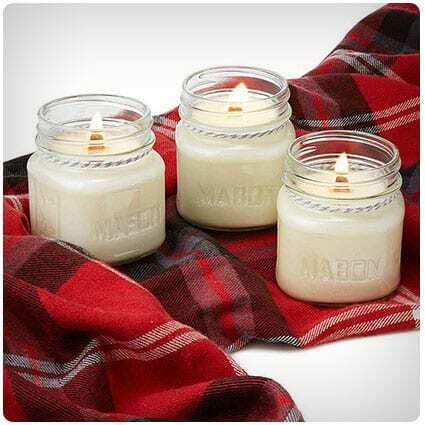 Fireside Cozy Candles make the perfect gift to give every host or hostess at your holidays parties. These soy-based candles are made from four simple ingredients that will warm any home Choose from Sweater Weather with hints of cinnamon, Mulled Cider with a touch of apple, and Snow Day that whiffs of cedar. A creative and fun gift to give your drinking friends is the Tonic Making Kit. This simple kit comes with all-natural ingredients from all over the world and a Mason jar for mixing and steeping. Add fresh citrus and sweetener to complete your very own mixed drink! Let’s get this party started with the Mason Jar Speaker and Amplifier. It’s a light, portable, and compact system that lets you plug your phone, guitar, or mp3 player into it. When you want music in your hotel room or having a backyard BBQ, this Mason Jar will be your favorite companion. 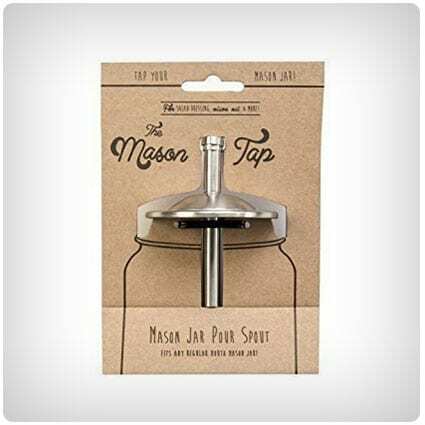 When making batches of infused oils or salad dressings as gifts in a jar for the holiday season, be sure to include a ‘Mason Tap’. This stainless steel Mason jar topper allows you to easily dispense your creations. Fits any regular-mouth Mason jar. You’ll always have fresh herbs on hand with these beautiful Mason Jar Indoor Herb Gardens. These colored Mason jars are a simplistic, but passive, hydroponic watering systems that will turn any black thumb into a green thumb. Plant the seed, add water, put in a sunny windowsill, and watch your herbs grow. Wooden Mounted Wall Caddy is made of gorgeous reclaimed wood that holds four Mason jars. It will keep and organize anything you need from flowers, bathroom items, or craft items. This would make a unique Mason jar gift for a new homeowner or someone living in a small space. Loew Cornell TransformMason Wire Handles are the perfect accessory to Mason jar gifts and crafts. Don’t just create a candle or a solar light craft to display on a table, design it as a hanging gift in a jar for the patio or garden. These wire hangers will take your crafts to a higher level. Turn a regular-mouth Mason jar into a Mason Jar Lotion/Soap dispenser with these lids. Decorate a jar to match your decor in the kitchen, bathroom, or bedroom, fill with your favorite lotion or soap, add a dispensing lid, and voila’, one-of-a-kind Mason jar gifts have never been so fun to make! Brew Your Own Kombucha Kit is a stylish and all-inclusive home brewing pack made from tea and sugar. It makes three batches of Kombucha. It includes a Mason jar for fermenting and two blue flip-lid bottles for drinking. It arrives in a wooden crate and already packaged to give as a gift. Mason Jar Shaker Lids add pizzazz to your gifts in a jar. It’s a shaker, a strainer, and a pourer all in one. Whether you’re concocting alcoholic drinks, spice jars, or scented bath salts, include one of these lids so the receiver can just shake and pour from the jar. FoodSaver Wide-Mouth Jar Sealer allows you to seal your home-canned Mason jars with ease. Put on a lid, cover it with the sealer, insert the hose into the lid and the sealing system, turn on, and in no time, your foods will be properly stored. Perfect for making gifts in a jar for the holidays. This DIY Butter Kit is not your grandma’s butter churner! This complete set makes a great gift for your favorite foodie. Choose your milk, add one or some of the included spices, and in about an hour, you’ll have your own unique blend. It comes with a Mason jar and a spreading knife. Red Mason Jar Ceramic Measuring Cups and Spoons will add character to any kitchen. The adorable measuring cups stack to create a mock Mason jar. Display it on the counter with the matching measuring spoons hanging on the wall behind it. Cups and spoons come in standard measuring sizes. This LED Lighted Lid Insert turns your Mason jar into light! Whether you are camping or decorating for a special event, these lids will add a special touch of ambiance to any Mason jar craft. Comes in a pack of two – one for regular-mouth jars and one for wide-mouth. Turn a Mason Jar into a Beautiful Sewing Caddy with the Tutu accessory. Keep it at home or in a desk drawer at the office for a lost button emergency. Fill the jar with buttons and thread, top it with a pincushion lid and keeps all your tools in one place. Fits wide-mouth Mason jars. You’ll want to create healthy lunches with the Cuppow Wide Canning Jar Lunchbox Adaptor. This blue cup is a container that sits under the lid of a wide-mouth Mason jar to hold dressings, dips, or anything you want to keep separated. It is top-rack dishwasher safe. Backyard barbecues just got a lot fancier with these Decorative Salt and Pepper Shakers. Embossed with Salt and Pepper on the side, these aqua blue Mason jars make a great addition to kitchenware. It holds over 8 ounces of spices, which means it will withstand the biggest parties. Includes a funnel for easy bottom filling. These adorable Reusable Hinged Jar Zipper Bags are sturdy, stand-up clear bags. Fill with your favorite snack or dry goods, zip, and stand them up. They are designed to resemble a Mason jar. Wash and dry them between uses and store flat in a drawer. Make gnome mistake, this DIY Gnome Terrarium Kit makes a great gift in a jar! Everything you need to make a home for this gnome is included. Makes a terrific low-maintenance plant for a dorm room or a man cave. It’s a great gift for the beginner terrarium builder. Smith’s Mason Jars Lid and Bamboo Honey Dipper transforms regular-mouth Mason jars into all-in-one honey jars. The honey dipper is a six-inch bamboo stick that holds honey and seals around a hole in the lid to keep out ants. You won’t bee-lieve it until you try it! You’ll brighten any party or walkway with the Mason Jar Lights. These solar lights are built-in Fairy Star Firely Style LED String Lights. It comes with 8 lids and 8 hangers to fit regular-mouth Mason jars and a charger. It makes a great housewarming gift. reCAP Mason Jars Canning Lid is a BPA-free, spill-proof lid that screws on to regular-mouth Mason jars. It’s a versatile lid that turns jars into a to-go, an organizer for small things like nails and buttons, and a food storage container. Makes a great way added gift for your gifts in a jar! Light up the night with these Solar-Powered Mason Jars. When charged in direct sunlight for 6-8 hours, these solar-paneled lids provide up to 12 hours of light with clean energy. Take them camping, keep them at your summer cabin, and keep them at home because you’ll want them everywhere! Taking a healthy lunch in a jar has never been so easy. Aladdin Classic Mason Salad Jar includes a leak-proof, dishwasher-safe lid with a 4 ounce container. It is made of durable Eastman Tritan making it difficult to break. It’s easy to just grab-and-go because salads will keep for a few days. Create your own lamp with the Mason Ball Jar Light/Lamp Adapter Kit. Add shells, baby memorabilia, and more inside the jar, add the lamp adapter, and you have a one-of-a-kind Mason jar gift that is sure to light up any room! It has a standard light socket, 5 foot cord, and an on/off switch. Iced coffee but without the drive-thru expense! Mason Jar Infuser Coffee and Tea Maker is a stainless steel mesh that fits wide-mouth jars 32 ounces up to 64 ounces. Add coffee grounds, tea leaves, fruit, or vegetables for perfectly brewed iced coffees, teas, and flavored water to always have on-hand. This Sipper Drinking Jar allows you to take your drink with you without needing to transfer to another cup. This set includes 2 16-ounce Mason jars, 2 acrylic straws, and 2 metal lids with holes for the straws. They come in a retail gift box making it easy to give it as a gift. Those stored Mason jars will be put to good use with this Mason Jar Cocktail Shaker. Turn your Mason jars into a sugar pourer, spice shakers, a cocktail shaker, and a sprouting jar. You’ll love discovering the multitude of uses of these lids. Say good-bye to cutting ribbons and burning your fingers with hot glue to decorate your Mason jars for gift-giving. Spruce up your holiday gifts in a jar with this Christmas Holiday Nativity Sticker Set. You’ll get 24 sheets of vinyl decal stickers that stick right onto your Mason jars. These stylish JarJackets make life much easier. Your hands will be shielded from the extreme temperature of your jar, as well as keep it from slipping out of your hands. They fit wide-mouth Mason jars and are microwave, dishwasher, and freezer safe. Avoiding plastics is easy with the ToGoJar Lid. Comes with an 8-ounce and 16-ounce Mason jar and a connector lid. It will keep your jars stacked but separate. Microwave, freeze, keep in the fridge, or store on the counter. This versatile piece will take gifts in a jar to a more creative level. Save money and the planet with the Coffee Cold Brew Gift Set. Cold brewing coffee in a Mason jar with a reusable cloth coffee filter makes mornings that much better. Rinse the filter and hang to dry. This set includes Brazilian and Guatemalan coffees. Makes a great gift for an iced-coffee lover. Tennessee Wicks Small Mason Jar Wall Sconce makes the perfect gift for a new homeowner. Fill the 8-ounce Mason jars with flowers, tea lights, or colored marbles for a gorgeous addition to any wall. They are seven inches tall and come as a set of two. They’ll fit into any small space like a bathroom. This Mason Jar Toothbrush Holder will transform a Mason jar into a bathroom accessory. This aluminum lid screws onto a regular-mouth jar and is dishwasher safe and will not rust. Organize your toothbrushes, razor, or combs. Dress up the jar and give it as a gift. Mason Jars with Multi-Use Lids is a six piece set that includes a canning lid, a clip top round lid, a spiralizer, a juicer, a grater, and a dipping pot. Lids fit on top of a Mason jar to allow you to juice, grate, or shred right into the jar making less dishes to wash.
Grinds will not seep through into your coffee with the T&Co. STOUT Cold Brew Coffee Maker Kit due to the stainless steel, 80-micron pore size filter. Kit includes a gasket for the infuser and a travel lid gasket for your mason jars to make it into an on-the-go coffee mug. A DIY Snow Globe is an easy craft to make in a Mason jar. Bring out the kids, the glitter, ornaments, a few supplies, and in a few simple steps, you have your very own wintery snow globe. Makes great gifts for co-workers, grandparents, and children. Makes great table decorations for the holidays, too. Holidays and lights go together like peanut butter and jelly. This Luminary Advent Calendar brings a fresh spin on the traditional advent calendar. Using 25 small jars, like the Mason jam jars, with numbered stickers, some Etching cream, and tealights, you’ll make an advent calendar decoration that will make a unique and fun holiday gift. With 3 simple ingredients, you can make these Homemade Bath Bombs. Combine baking soda, citric acid, and massage oil, press into shaped silicone molds, let them dry overnight, then store in a jar. These make great gifts in a jar for everyone on your gift list. This Christmas In A Jar is a fragrant gift that will brings the scent of Christmas to any home. Layer some mulling spices, a fresh orange, some cranberries, and a rosemary twig in a Mason jar, print out the preprinted labels and you’ll have the perfect hostess or unexpected guest gift! Looking to make your child’s teacher or reading tutor a unique gift? Give her this Dr. Seuss Gift In A Jar. This gift is quickly made with a Mason jar, paint, and a printer. Fill the jar with bookmarks or pencils. This Mason jar gift will look perfect on their desk. These Homemade Gifts In A Jar will ensure that you always have a gift on hand for unexpected guests. From soups to muffins to desserts, these gifts in a jar are easy and fun to make. Don’t forget to include the printable recipe and gift tag! Bath Fizzies In A Jar make an easy and frugal gift for the women on your gift list. Stir together the 6 ingredients, pack each fragrance into separate silicone ice cube trays, and dry overnight. Gently pop them out and put them into clear jars. Decorate the jars with the colors of the fizzies. 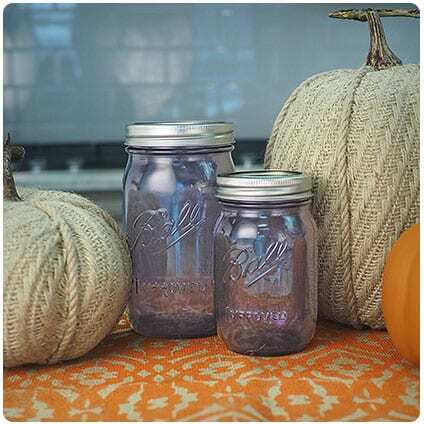 Your crafter will appreciate this Craft Mason Jar Gift. Add craft supplies like beads, hot glue sticks, Sharpies, and more to personalize this gift in a jar. Decorate the Mason jar to add a touch of pizazz by gluing decorative paper onto the lid and a ribbon around the top of the jar. This Tea Lover’s Mason Jar DIY is an easy gift to put together. Pack a Mason jar with items such as an infuser, tea bags, sugar packets, a honey dipper, and a few of their favorite cookies. Adorn with crinkle paper and washi tape for a delightful gift for the holidays. DIY Nutcracker Jar Toppers just scream Christmas. Take the hair and beard off of a mini nutcracker, spray several coats of paint in holiday colors onto the wooden ornaments, then glue to the lid of any Mason jar. Fill the jar with any holiday goodies like peppermints, homemade granola, or almond bark. An amazing homemade gift is Cinnamon Honey Butter In A Jar. With twine, fabric, and holly, the decor of this jar may be old fashioned, but the sweet taste of this recipe is in vogue. This butter pairs deliciously with homemade bread or bagels. Everyone on your list will want this year after year. Minibar In A Jar says it all. Fill a one gallon wide-mouth jar with 5-7 mini bottles of alcohol. In adhesive vinyl lettering add the words OPEN BAR to the lid. This makes a great gift in a jar for groomsmen, a 21st birthday, or for a home bartender. Take a moment with Spa Scrubbie And Tropical Bath Tea Soak. This gift in a jar will soften your skin and loosen your muscles as you sit back to relax in the tub. The soak is made with ingredients found at the grocery store. Add the homemade scrubbie for an ideal gift for a tired mom. This Salted Caramel Sauce will satisfy any sweet tooth with ease. This recipe will fill four small Mason jam jars. Add it into pancakes, dip apple slices in it, or pour it over your cheesecake. Don’t forget to print off the free labels to add to the lids. Your favorite grill master will enjoy this dry rub recipe. This Pork Rub Recipe in a jar helps you put together a delicious dry rub for pork and gives you a free label to print off to add to the lid of your Mason jar. Secret Santa Cookie Deliveries will become your favorite holiday tradition. Make these adorable Santa cookies out of Nutter Butters, white chocolate, colored sugar, mini chocolate chips, and red-hot candies. Put them in a Mason jar and sneak them on your neighbor’s porch or your secret buddy at the office. Jazz up your holidays with Cinnamon Sugar Popcorn. This simple yet addictive gift in a jar will make you everyone’s favorite gifter. Fill any size Mason jar with popcorn kernels. Print off the instructions and a label, place them onto the jar and your gift is ready! No need to spend a fortune for gifts this holiday. Peppermint Sugar Scrub In A Jar is an easy and frugal gift made with four simple and inexpensive ingredients and a Mason jar. You’ll make this scented scrub for all the women on your holiday list. Don’t forget the printable free label for your lid! Cappuccino Mix in a Jar will be the favorite drink this winter. Layer the ingredients in a Mason jar, place a label on the lid, tie on a decorative tablespoon, and your gift is ready. Place a jar by the coffee machine to share with your co-workers or offer it at your holiday gatherings. This Homemade Bath Salts Recipe will make bathtime a relaxing moment. This blend of all-natural ingredients in a Mason jar will please even the hardest gifter. Choose your essential oil (peppermint, lemon, lavender, and more) and decorate the jar. You’ll wonder why you haven’t made this easy and thoughtful concoction every year. This DIY Beginner Sewing Kit is a pint-sized gift that is filled with essentials every novice sewer needs. Spray paint the Mason jar ring and follow the easy instructions to make a pincushion on the lid. Fill the jar with supplies like thread and straight pins. Makes a terrific gift for the college-bound student. You’ll never pay store prices again with this Homemade Laundry Soap. 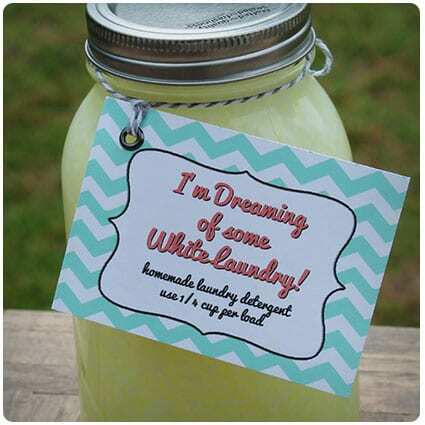 Whip up a batch of this detergent, separate into large Mason jars, add a ribbon with instructions, and you’ve created a unique gift. Perfect for the bachelor, college-bound student, or even your neighbor. You can create a Candy Cane Hot Cocoa Bar with a wire basket and three 32 ounce wide-mouth Mason jars. Fill one jar with candy canes, one with marshmallows, and the last one with your homemade hot cocoa mix. Print out some tags and add a chalkboard sign for a unique hostess gift. You can make your own Hand Soap Gift with two simple ingredients: glycerin and non-moisturizing bar soap. Once you’ve created your soap, fill a Mason jar with liquid and add a dispenser lid. You’ll have a one-of-a-kind gift in a jar for teachers, daycare providers, or the bachelor. Toffee Blondies are sweet treats that will have you making a jar for yourself. Layer the ingredients in a large Mason jar, print off the baking instructions, then tie it to the jar with a string. In no time, you’ll have a sought-after gift in a jar that everyone will look forward to each year. Peppermint Stick Cocoa is perfect for cold weather. Layer ingredients in a 1-quart Mason jar. Add a card with the jar and you are ready for the holidays. Each jar makes 12 servings. You can either make individual cups or pour it into a crockpot for holiday gatherings. Makes a great gift for the mailman. Detox Bath In a Jar will be a favorite gift that you make for yourself and others. Mix together epsom salts, ground ginger powder, baking soda, and lavender essential oil, then pour into a small air-tight Mason jar. Add a decorative card with directions, and sit back, relax, and enjoy knowing you’re aiding the health of others. Quart sized Mason jars are the perfect size jar for quirky gifts. Scour the dollar store or travel-sized item aisle to put together personalized gifts for the people on your holiday list. Whether a traveller, a sewer, or an athlete, you can put together a gift in a jar that they’ll love. Your children will enjoying helping you make Gingerbread Playdough for their playmates. Lay the ingredients out for them to add to the pot when ready. Keep the playdough in an airtight Mason jar. Tie a few cookie cutters onto the jar and you have the perfect gift for toddlers or grandparents..
A thoughtful gift for your partner is Date In A Jar. Fill and decorate a Mason jar with a date idea (putt-putt golfing, movies, etc.). Take it on the date to fill with ticket stubs, pictures, or any memorabilia. This could also make a memory jar of the first date with your spouse. Bring the smells of the holidays to homes with Christmas In A Jar. In a large Mason jar with a screw on lid, combine the pot pourri ingredients listed. Tie a a tan coffee filter to the lid, print off the labels, and stick onto the jar for a super easy gift for the neighbors. You’ll be surprised how easy it is to make a Rosemary Mint Sugar Scrub. Mix together sugar, salt, a carrier oil, and an essential oil and store in a pint-size Mason jar. You now have the perfect gift for all the women on your holiday list. You’ll need to start this gift in a jar right after Halloween. That’s when the holidays begin, right? This Vanilla Extract recipe consists of vanilla beans and vodka. Store these in an airtight Mason jar for steeping for a good six weeks. Makes a unique gift for the baker on your list. With the stress of the holidays, this Gift In A Jar gives people permission to stop and breathe. Fill a large Mason Jar with pampering supplies like nail polish, lip balm, and more. Add a handmade tag to the lid to remind them to take time to pamper themselves. A thoughtful gift to give for any occasion is Banana Bread in a Jar. Mix the ingredients and pour straight into the Mason jar to bake in the oven. When the jars are cooled but still warm, seal the lids. Decorate the lid with fringed fabric and a tag and you have a unique hostess gift. You’ll definitely be barking up the right tree with this chocolate bark in a jar tutorial from TheMuse. Each recipe gives you a different flavor, and all you have to do is choose from s’mores, pistachio and cherry, or red and green, make up a Mason Jar with the ingredients, and add a ribbon and instructions. This is a recipe to DIY for! The cupcake in a jar tutorial shows you how to make everything needed to fill a Mason jar with delicious cupcakes layered with fabulous frosting until you reach the top. Finish off with a decorative label and a spoon and you have a gift that’s good enough to eat.